Remember that simple and delicious tomato sauce I posted a couple of weeks ago? This recipe is by the same lady. (Sidenote: I'm pretty sure that I'll have to name my first-born "Marcella.") 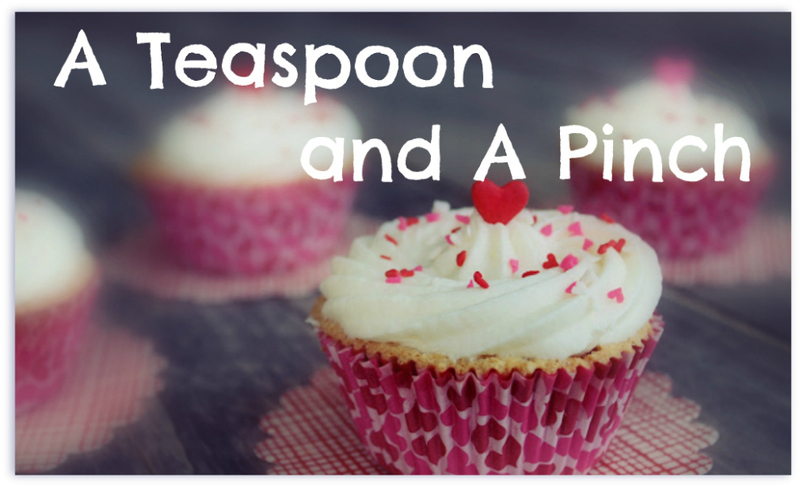 Like that recipe, this one uses only a few ingredients and is very, very simple to put together. And it's Holy Dear Goodness Amazing. I'm telling you, this is yummmmm. The chicken itself turns out moist, and the meat was falling off the drumsticks. And that broth hiding up there in the photo? I nearly slurped it up with a spoon. That's no lie. I kept dipping my white meat into it. I also saved the leftover broth to make into a gravy tomorrow night, and I'm pretty sure that it, too, will make me fall on the floor in bliss. 5 spoons? We vote this a 10. Wash the chicken thoroughly in cold water, both inside and out. Remove all the bits of fat that are hanging loose. Let the bird sit for about 10 minutes, tilted, to allow all the water to drain out. Pat dry with paper towels. 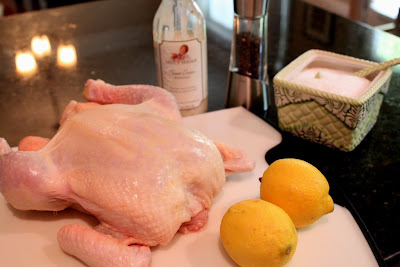 If you're using the marinade, spread it under the chicken skin, to coat entire chicken. Sprinkle a generous amount of salt and pepper over the entire bird, rubbing it with your fingers over the body and into the cavity. Wash the lemons and dry them with a paper towel. Soften each lemon by rolling it on the counter while pressing down on it with your palm. Poke the lemons 10 times each with a fork. 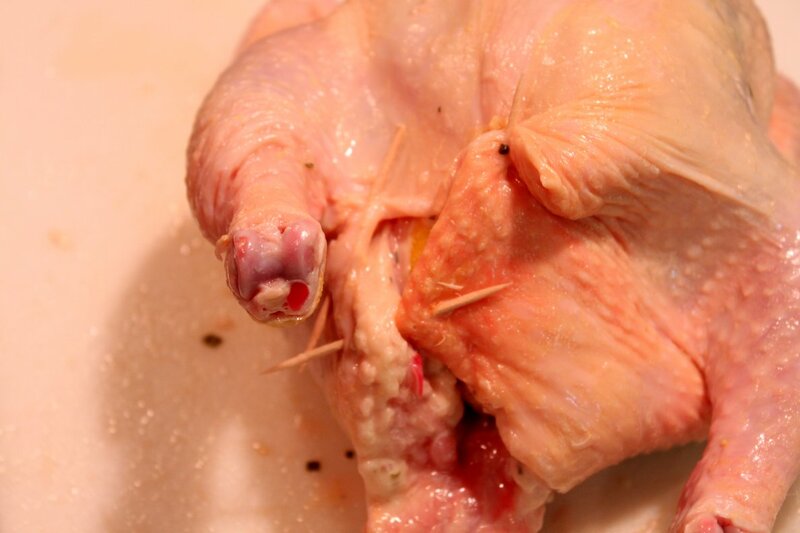 Put the lemons inside the chicken cavity, and close up the opening by securing the skin with toothpicks. 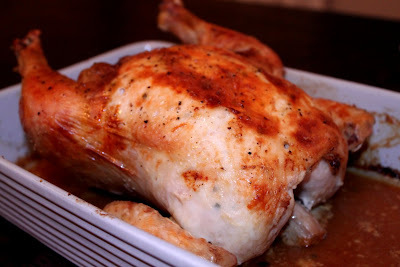 Put the chicken in a roasting pan, breast side down (no oil or greasing necessary). 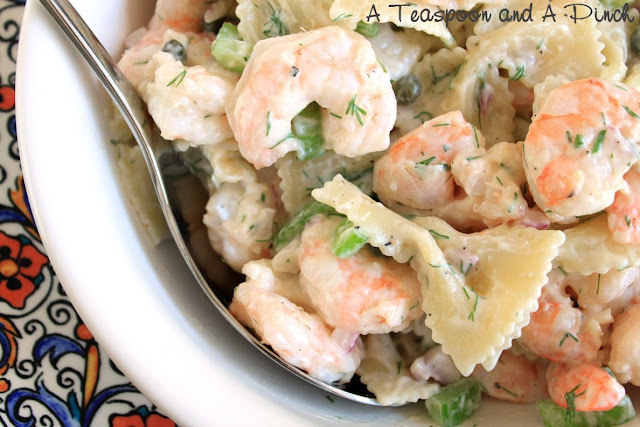 Place it on the middle rack of your preheated oven and cook for 30 minutes. Then, flip the chicken over so the breast is facing up. Cook for another 30 minutes, and then turn the oven temp to 400 degrees. Cook for another 20 minutes, or until internal temp reaches 165 degrees. Remove chicken from the oven and allow it to rest in the pan for 10 minutes. Then cut it up and eat it up! Make sure you spoon some of the broth in the bottom of the pan, it's beyond amazing. first separate the skin from the meat, using your fingers. Do this all over the entire bird. And then push the marinade between the skin and the meat. 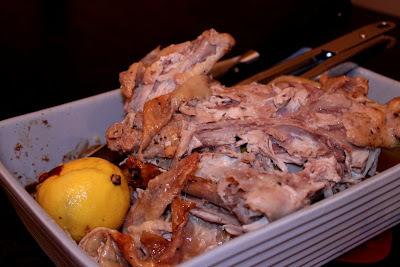 Put the small lemons into the cavity of the chicken. And then suture up the opening with toothpicks. How simple and easy - I haven't tried a fryer chicken since the whole red onion fiasco - I need to give this a try though! I've always been too intimidated to try a whole chicken. Thanks for the wonderful recipe! Bookmarking it! sounds good but the raw chicken pics make me want to ^#@%#. Maybe it's because we have the stomach bug?